This weekend, ISSUE Project Room and Pioneer Works present a FREE outdoor party of experimental electronics and noise in Red Hook headlined by Kentucky-based psychedelic noise trio Hair Police. This all-day event features “Scumbag Electronics” from Chris Goudreau AKA SICKNESS, the electronic noise/punk band White Suns, Boston-based five-piece noise/punk ensemble Guerilla Toss, noise composer Bob Bellerue, and the muscular saxophonist Tamio Shiraishi with Cammisa Buerhaus on a Soviet synthesizer. 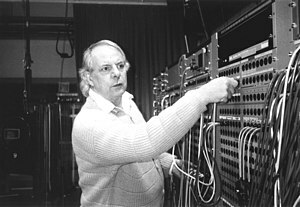 Over the course of his prominent career, the German composer Karlheinz Stockhausen took on myriad guises. To the European postwar establishment, he was an enfant terrible, embracing the objective rigor of total serialism and the uncharted vistas of electronic music and happenings. For adventurous jazz and rock musicians like Miles Davis, the Beatles and Frank Zappa, he was a Promethean figure who delivered unto the world techniques for fashioning mind-altering sounds. Free downloads of recent Open Ears Music shows are available.